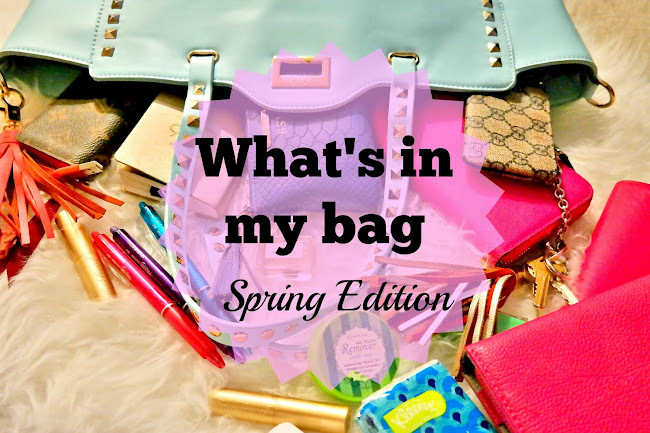 It's been over a year since I've done a "What's in my bag" post and I'll be honest, these are some of my favorite ones to read - so I thought why not share what's in my newest tote for Spring. You saw the tote itself on my post last week and it was a fluke find at TJ Maxx a couple months ago!! Wallet || Business Card Holder || Keys // The Kate Spade wallet was a purchase in Charleston last year and I absolutely love how big it is and surprisingly everything has it's place so it doesn't get cluttered. My business card holder also doubles as my wallet when I have smaller purses or clutches. This was a gift from Gary for my birthday when we were in Dubai. I only keep my T (train) pass, small photo of my nieces and nephew & Gary's business card in my key pouch. Phone || Lighting Cable || Back Up Charger // My MIL purchased this lighting cable for me and it's perfectly sized! I also don't have to worry about other cables because it fits perfectly into my portable charger. Funny story about these portable chargers - I used to have this really pretty one from ban.do, but it would always fall out and not keep the charge, so I started using these swag ones you get at conferences and they work like a charm! I also have to tell you about these little bobino cord wraps. I bought this for Gary three years ago as a little stocking stuffer and lover it so much that I ended up buying myself one too! It's super handy and my earbuds never get tangled anymore! Notebook || Planner & Pens // Ever since downsizing to one notebook for blog & business I've got so much more room (and it's less heavier too) - I also downsized my planner last August to be more compact and I'll tell you that this is the longest I've gone with one planner in a few years! As much as I love TJ Maxx for regular notebooks, I gravitate to Paper Source for notebooks and planners that I know I'll use for longer/for business. The amount of lipsticks/glosses I carry with me on a daily basis is obscene - even worse I not only have them in my GiGi NY zip pouch, but I keep the ones I use the most frequently in the side pocket! I also keep a small fragrance with me for those touch ups after the gym or before going out after work (which really doesn't happen that often haha). I really like the light scent of Tender Romance and it reminds me of vacation, which a welcome smell while at work! I carry santizer gel since I'm not ashamed to admit I'm a germaphobe and I also have tissues with me because it's allergy season and pollen tends to not agree with me! After years of not carrying headache medicine with me, I've learned my lesson and always have bottle! I also have a these little nail polish remover pads because I can't stand it when my nails are chipped so this easily removes them and they don't have that offensive nail polish remover smell which is always nice! The heaviest thing in the tote is my iPad...sadly this is a necessary evil since I commute I like to read magazines and books. I'm still loving my cover / keyboard, but keep the keyboard portion at home when I'm not travelling. Odd items that you might also find, but not currently in there are kind bars and extra pairs of earrings that I take off during the day and forget to take out!! Funny enough during the work week I rarely take my sunglasses with me, which is why they aren't pictured here! What are some things you carry on the daily? Anything you carry that isn't needed? *I was provided a sample of the perfume from Influentser. All opinions are my own. Such a fun post! I love how bright and colorful everything is in your bag! Sunglasses , as well as my actual glasses, are a must-have for me. This is such a fun post! I will have to do one too! I have the Erin Condren planner and it's so heavy to carry every day but I do it anyways. If I could break up with it I would get a smaller and lighter one, but I love my EC one too much. Love that you carry your iPad with you too--I do that sometimes! What a fun post! I also carry a huge zip pouch full of lipsticks and lip glosses! I am glad that I am not the only one! Love the pretty color of this bag! Perfect for spring! I have about a billion lip things in my purse too!! And of course a hairbrush! Your bag is insanely organized and very colorful ;-) I try once a week to go through and declutter mine. Those receipts seem to take on a life of their own sometimes. Look how much pretty stuff is in there! I love all of the bright colors! I love seeing what people have in their bags. I have bags inside of bags too, really helps me stay organized! I love all the bright colors of your accessories! Gorgeous bag!! And I'm loving all the fun, bright colors! Someday I'll have a cute bag full of anything but diapers and fruit snacks again, HA! But I'll never again go without wipes in my bags.... you can use those baby's on ANYTHING and everything, ha ha! Always fun to read posts like this!! I think I really need to get a bigger bag though – I use mine for work and with two notebooks and a computer, everything is always so crammed and hard to get to! holy moly a lot of stuff - but so organized! i have downgraded from a tote to just a small RM cross body lately and i am into it. but i miss having all the things haha. i like how everything is organized into pouches - that's what i'd do! Love these posts, it's so fun to see what other ladies carry around on a day-to-day basis. Love your bag too!! love these always! love the colors, too! that kate spade is calling my name in that bright pink!! Cute! I love all of your little pouches! Hand sanitizer and head meds might be the most important! I'm loving that Kate Spade wallet! Loved this post! High five for a fellow germaphobe & hand sanitizer. I usually keep 2 in my purse in case I loose one - haha! I love all your little bags. I can't go without my kindle in my purse which gives me weight every time. You've inspired me to get a cardholder! There are wayyyy too many cards in my wallet. I never even thought to get one before. Love this post!! You have the happiest and brightest bag I've ever seen! I've been loving my Kate Spade wallet (I think it's the same as yours) that I got for my birthday because it's big and holds everything. I still want that tassel charger! These posts are always so fun! I really need to get a business card holder. I have them in a little pocket on the inside of my tote, but a card holder would make things so much easier! You are my go-to girl, Biana! You ALWAYS inspire me with your posts, giving me so many ideas and introducing me to so many different products and resources. I need to get those Absolute Nail Polish Removers, they're so cute and compact and it's great to know that they not only lack that offensive scent, they're acetone free, too! I love all your pretty pouches and wallets, so fab! Thanks so much for sharing, I really enjoyed this post, beautiful! I hope you have the best day ahead! You always have such fun things in your purses! I think that if you opened up mine right now, you'd find a wallet and about 5 coozies. Nothing exciting in there! Dang you are all set and so organized! I love it! That little Gigi bag is so adorable and I love your business card holder! Talk about bag organization goals! I am loving that blue bag! I love a purse that holds a lot. Mine is small but holds a good amount! I also like these posts and it's been a while since I've done one. So fun! I love how organized your purse is and how everything has a place. Such a fun bag for Spring! Love the pop of blue! I adore your bag and wallet, so pretty! Had we known we were going to post the same thing on the same day, we should have collabed! LOL! You are so organized and ready to go, love it! I love finding out what's in people's bags!! I feel like I want to do one too, as my bag has changed quite a big since I last did one. I want to get a larger wallet, but then I don't like having to carry such a big wallet when it's just that and not a purse. I still love that charger! I have a portable charger but I keep forgetting to put it back in my purse charged haha. I love reading this type of posts as well. You carry quite many things. Love yur bag and wallet. I always keep antibacterial hand wipes in my bag. It is always fun to see what others are carrying in their bags on a daily basis. I myself decided last week that I am lugging around way too much and need to purge! No one needs 10 lip glosses at one time. LOL. I recently combined my blog and business planners in to one and it's actually working out better than I originally thought it would! I love having the extra space in my purse! I have the same wallet in black and I LOVE it! It keeps me organized and it fits perfectly in all my bags. Coveting that sleek and chic LV card holder! Everything is so cute! I love that bag! I love reading What's In My Bags... such a gorgeous tote and I love those tissues hahaha. I don't know if it's possible for a woman to not carry multiple things of lipsticks and lipglosses around with her! I don't even reapply multiple times a day, and I have like 4 or 5 in purse! An iPad is definitely a necessary evil for a commute! I would be bored without mine! Wow you have a lot of stuff in that bag! I admit, I'm the same way...and then I complain of my shoulder hurting! Erik always says my bag is a weapon with how heavy it is! I love your business card holder! I love 'what's in my bag' posts! Your pictures are so vibrant and beautiful! Love your LV zippy, I need one of those! 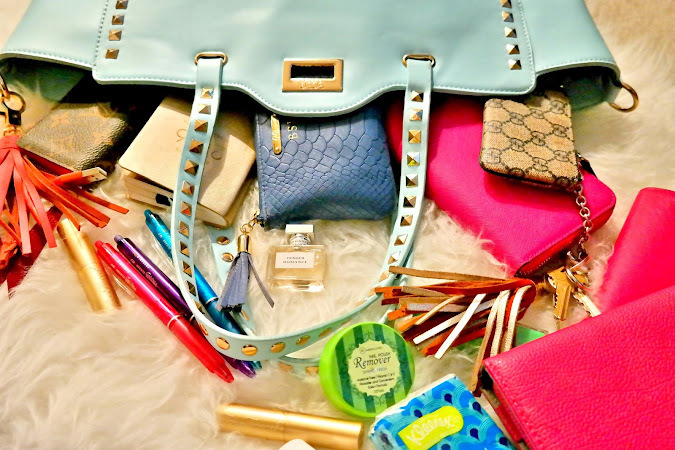 Everything in your bag is so girly and colorful, it's awesome! I love scoring beautiful purses like that at Marshall's and TJ Max...looks like I pack pretty much the same things into my purse except sunglasses are essential for everyday wear here. that bag is so pretty, what a great tj maxx find! love when that happens. i'll have to check out the nail polish remover pads, so handy. and i'm with you on the tissues! i freak out if i don't have tissues close by. Yours is so pretty!!! Mine is legit a crumple of stuff. Kind of oriented in the same sphere as the stuff you have but it ends up one thing of mumbo jumbo. Love that you have many lipsticks etc with u as well. Me always! That bag is so cute! I love it!! Everything in your bag is so colorful! Love that LV business card holder! So cute!! I need one! Don't you love a good TJ Maxx bag find?! I always get so excited about those! Loving your phone case, too! Wow you're really prepared for anything! I've seen those tasseled chargers everywhere, but have yet to get one. I'm also looking for a key ring/bag charm though, so it might just be perfect. This is such a fun post, Biana! Love seeing what is in your bag! I have waaaaaay too many lipsticks/glosses in mine too! Such an incredible tote! Love the mint color! These are always fun posts to read - love the tote! LOVE "What's in my bag" posts! They're so fun to read! I absolutely LOVE that bag--the mint color and the studded detail is so fun! I love seeing what's in other people's bags- and I love how colorful all the notebooks/wallets/cases are in yours! Your bag is ADORABLE, first of all! Second, I'm basically saving this because you have everything you could ever need in here! I love it!!! I have a very similar Kate Spade wallet and I love how big it is! I always love posts like this, thanks for sharing! I once did a post like this but it was "What's in my Makeup Bag"!! So fun!! I carry a changer too - have to! Love your bag, btw!! See, now I don't feel so bad about what I carry around in my purse because we are on the same page, lol! Because of my job, I have to carry around my entire life with me. Also, I love that marble phone case! Such a cute tote!! Perfect color for spring! I always love posts like this and I have been meaning to do my own for a while now. Loved seeing what is in your bag. Your pouches and wallets are all colorful and cute as is the new baby blue tote. Thanks for the tips on the chargers too. I love that yours looks like a fun big tassel. Now I will go back to see your previous post like this, from last year lol. Welcome by and linkup this post with me tomorrow since it is also style-related. Thanks! Love seeing your post! And how gorgeous is that bag?! I love a good purse peek! It's so organized and makes me so happy! I love the dupe, I was actually eyeing it a few weeks ago at TJ Maxx! I love posts like this! I just looked in my bag and cringed at the state of its contents and wouldn't want anyone to see inside it!I am going to clean it out this evening. I always have too much (erin condren and Ipad make it heavy) but I guess that is what us ladies do! Cute bag! Love all of your clutches and pouches too. How do you keep it all organized. When I use big bags everything gets lost and mixed up! I LOVE the color and size of that bag! It screams spring! Now, mine would probably include a few diapers & baby wipes, but it looks like there's room for those, too! Win, win! Your bag is super cute, first of all! And the nail polisher remover looks really interesting! I think I need some of that in my purse too! Love this bag! So pretty! I've got that lightning cable on my wish list since your last mention of it! I seriously need to get a bigger bag and be better prepared like you!! I carry a cross body and never have anything when I need it!